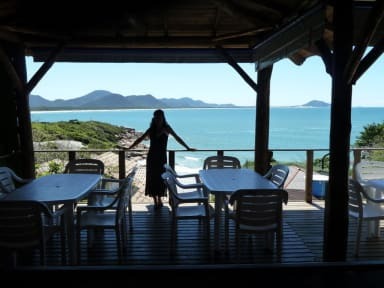 Barra Beach Club Oceanfront Hostel, Florianopolis, Brazylia : Rezerwuj teraz! My 5 star staff will inspire you to enjoy all the great activities and good times that this beautiful island has to offer and that we are excited to provide ! Please contact us direct before booking for best Hostel World prices and discounts!! AND if you want to stay with us for more than 6 nights. *New Years - minimum 6 nights starting Dec. 27th. *Carnival- minimum 3 nights. DAY-TIME ... Surfing! ( We are a REAL SURF HOSTEL with FREE SURFBOARDS! ), Professional Surf Classes, Boat Parties, Sand boarding, Stand-up Paddle Boarding, Windsurfing, Paragliding, Hiking, Guided boat tours, Kite boarding, Rafting, Scuba diving, Rock climbing, Hang gliding, Kayaking and more! NIGHT-TIME ... We have the best prices and V.I.P entrance for clubs Warung Beach Club, P-12, Stage Music Park, Malam, Terranzas and many more! We have a capacity of 50 guests with 9 bathrooms. All Dorm Beds have individual security lockers and ceiling fans. All Privates have Ocean Views, air conditioning and ceiling fans and are 35 meters from the beach. You will sleep with the sounds of the sea. Surfboards & Beach toys , Ping-pong, Healthy Breakfast , Wi-Fi, Bath towels, Cotton Linen, Ocean views, Daily room & house cleaning. Oceanfront bar , 24/7 security, ( laundry service), BBQ area, hammocks, surf school bookings with discounts, organized social events and 3600 meters square of oceanfront gardens, walkways, and social areas.